Zoisite was the mineral name for a series of opaque to translucent varieties, of which only two are used as gemstones: massive pink colored thulite and a brilliant apple-green zoisite (which also occurs in grayish-white, gray, yellowish-brown, and greenish-gray). Named for Czechoslovakian Baron Zois von Edelstein, zoisite never really achieved prominence as a gem material. 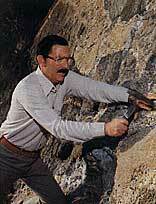 Then in March 1966, an Arusha tailor named Sousa discovered a deep blue gemstone at a place later known as the Merelani mine. Using sophisticated equipment experts found that the gem was not “sapphire” as suspected, but an astounding variety of zoisite. Tiffany and Company, in a vigorous sales promotion, named the stone “tanzanite” after the country of origin, and the name has since been generally adopted. 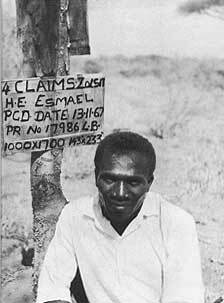 The Merelani deposit was difficult to reach in the Usumburu Mountains that border the Umba Valley of northern Tanzania. 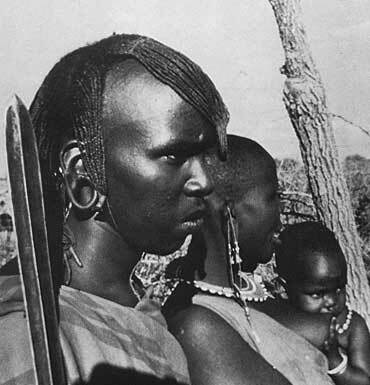 This region, a vast arid plain broken by hills and small mountain peaks, is inhabited by the pastoral Masai people. The Merelani lies between two landmarks just south of the Kenya border – Mt. 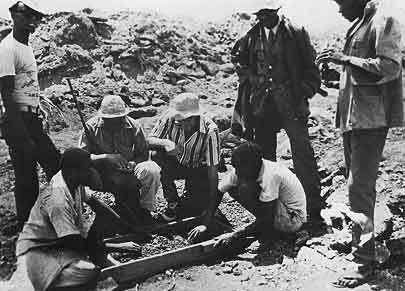 Kilimanjaro and the Olduvai Gorge made famous by paleoanthropologist Louis Leakey. The nearest town of any consequence is Arusha, about 50 kilometers to the northwest. 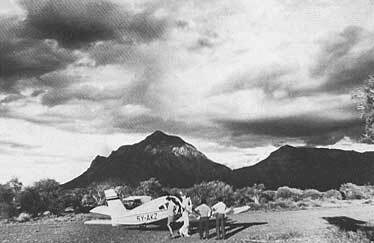 In 1975 the author met A.H. (Brick) Stange who provided a pilot and a single-engine airplane for the flight from Nairobi to Arusha. 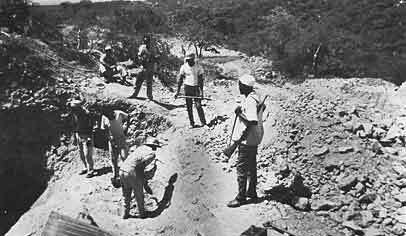 We planned two trips – first a visit by plane to the ruby mine near Longido and the second in jeeps to the tanzanite mine in Merelani. The trip to the ruby mine was uneventful except for a painful bite from a tsetse fly. Even though my seat belt was fastened, I jumped hard enough to bang my head on the cockpit ceiling and the pilot lectured me on how dangerous it was to make such a violent movement while flying at a low altitude. Just as he concluded his rebuke, a fly bit him on the neck. There was an immediate plethora of epithets, somewhat superior to mine, but no more lectures! Upon reaching the mine we noticed a great wall of schist marked by green streaks of zoisite. Closer inspection revealed bright red, nearly opaque 2 to 4-centimeter ruby crystals imbedded in the zoisite. Large chunks of the red and green material were blasted loose for shipment by truck to Arusha. A few days later our party left in two jeeps for Merelani. Our route passed through a brushy countryside dotted with trees, and from time to time, we passed Masai villages and herds of Brahman cattle tended by one or two small boys. Upon reaching the mine, we were admitted by armed guards. The tsetse flies were replaced by numerous non-biting flies that landed upon any part of the body which exuded moisture – the corner of the eye or mouth and exposed parts when relieving oneself. They were a constant irritant and a real nuisance. Guards armed with rifles and shotguns were conspicuously posted at vantage points about the workings. 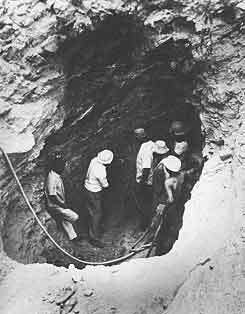 Digging was by the open-pit method, with a few veins being explored by short tunnels. A small padlocked iron box sat nearby. 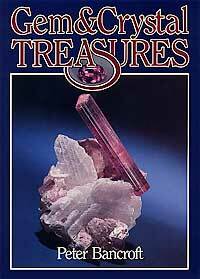 When a miner discovered a crystal or segment, he was to drop it into the box. However, the chances are that many were swallowed or thrown into a bush for recovery later. 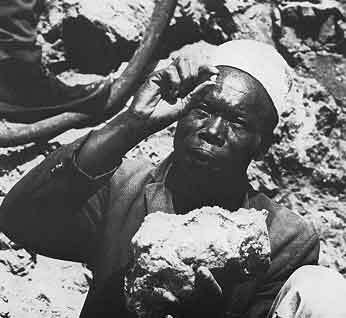 Miners were paid next to nothing, and this provided the incentive to high-grade stones. 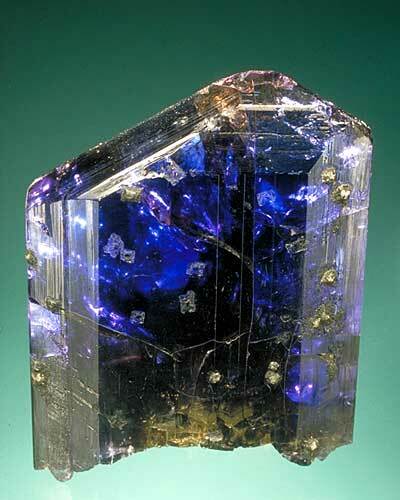 Tanzanite crystals occur sparsely in a heavily metamorphosed zone of tough rock. They are prismatic, heavily striated and often possess good terminations. The mineral is fairly soft (6 to 6.5 on Mohs’ hardness scale) and fractures rather easily. It is common to expose a fine crystal deeply imbedded in rock, then watch it break into small pieces during removal. The search for crystals is accomplished with picks, iron bars, shovels, and compressed-air jackhammers, a system that takes a high toll of fine gems. Clean stones which will facet 2-carat or larger gems are quite rare, and days pass between discoveries. Tanzanite occurs in colors of gray, brown, violet, blue, reddish-purple, and tints of green. The gem is of interest because of its exceptional pleochroism. Rotated in different directions a single stone will exhibit three outstanding changes of color, from reddish purple to blue to deep purple. 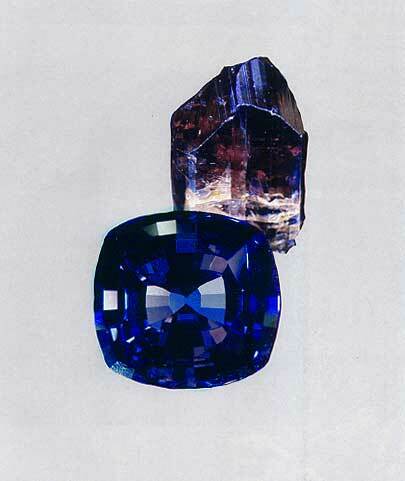 When placed in ovens and heated to 620°C, the reddish purple crystals alter to a rich violet-blue; some turn to a deep blue resembling sapphire. But heating reduces pleochroism. Tanzanite in large flawless sections appeared with some regularity during the early days of mining. Lovely gems of 20 to 50 carats were not unusual. One of the largest stones, a splendid faceted flawless gem weighing 122.7 carats, is part of the Smithsonian Institution's collection. Following tanzanite vein into hill. 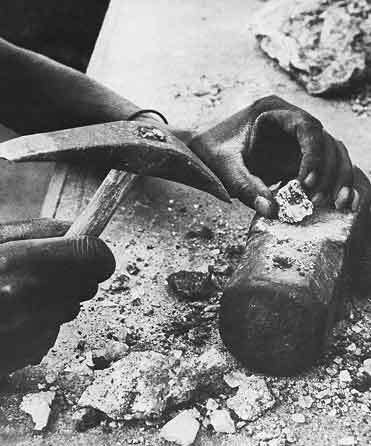 When first mined, fine stones could be purchased in Tanzania, Kenya, and the United States for as little as $20 a carat. By 1984 clean gems wholesaled at better than $1000 a carat, an indication of increasing interest in a gem already in short supply. In 1978 a massive cholera epidemic struck northern Tanzania and interrupted production of rubies, garnets, sapphires, chrome tourmaline, chrysoprase, and tanzanite. In addition, most of the known gem deposits were playing out. As a result, decreasing production has caused a scarcity of quality gemstones and a rapid rise in their value. Introduction/Name.Tanzanite is the name given to the rich blue-violet variety of the epidote-group mineral, zoisite. The gem was first discovered in Tanzania in 1967 and was named after its country of its origin, Tanzania, by the famous New York jeweler, Louis Comfort Tiffany. Color. Tanzanite has what many would consider the finest blue hue in the world of gemstones, a color which often leaves even the finest sapphires lacking. The gem is strongly trichroic. A chromium-colored green tanzanite is also found in Tanzania. Lighting. Tanzanite is extremely light sensitive, with incandescent lighting tending to shift its color to the violet side. The best pieces show an intense blue under any light. Clarity. In terms of clarity, tanzanite does occur in reasonably clean crystals. Thus when buying, the standard is eye-clean stones. Cut. 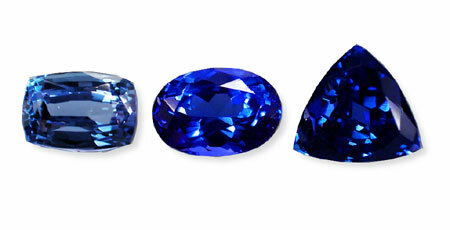 In the market, tanzanites are found in a variety of shapes and cutting styles. Ovals and cushions are the most common, but rounds are also seen, as are other shapes, including emerald cuts, trillions, etc. 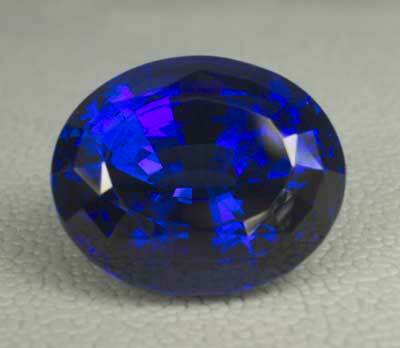 Cabochon-cut tanzanites are not often seen. Prices. Tanzanite prices probably fluctuate more than any other gem, largely due irregular production at the mines. For extremely fine stones of less than 50 cts., prices sometimes top $1000/ct. at retail. Stone Sizes. Tanzanites sometimes occur in extremely large sizes, with faceted gems of hundreds of carats in existence. The most popular sizes for jewelry use are those below 20 cts. Sources. The only locality for tanzanite is Merelani in Tanzania. Enhancements. Virtually all gem tanzanite of a blue color has been heat-treated to enhance the color. Imitations. Tanzanite has never been synthesized, but a number of imitations exist. The most common is blue-violet glass. A synthetic fosterite has also been used as an imitation. Phenomena Cat’s eyes are known. Many tanzanites display a color shift from blue in daylight to violet in incandescent light. The best way to care for tanzanite is to clean it with warm, soapy water. Heat: Fuses under jeweler’s torch; sudden temperature changes may cause cracking. Enhancements Virtually all tanzanite is heat treated (approx. 500°C), which converts the brown pleochroic color to blue.